This Danish film finds teacher, Lucas (Mads Mikkelsen), estranged from his wife, trying for greater custody with his teenage son, Marcus (Lasse Fogelstrom) and whose school has closed, working in a kindergarten. His best friend Theo (Thomas Bo Larsen) has a daughter, Klara (Annika Wedderkopp) in the class, and as her parents are fighting a lot, she latches on to the innocent attention that Lucas gives her. However, after he feels she is getting too attached, she feels slighted and makes a comment to the woman who runs the kindergarten, Agnes (Anne Louise Hassing) that suggests Lucas has been sexually inappropriate. Things are handled in a manner that quickly turns almost everyone against Lucas in a most distressing fashion. I knew this would be a difficult film. It is certainly sadtacular; the whole time, I was wondering that, if I knew a child who had made the type of comment Klara did, would I immediately suspect something? What if it was someone I knew well? Often, you hear of people who suddenly turn out to be a total creep; and the innocence of children is just so important. What do you do? 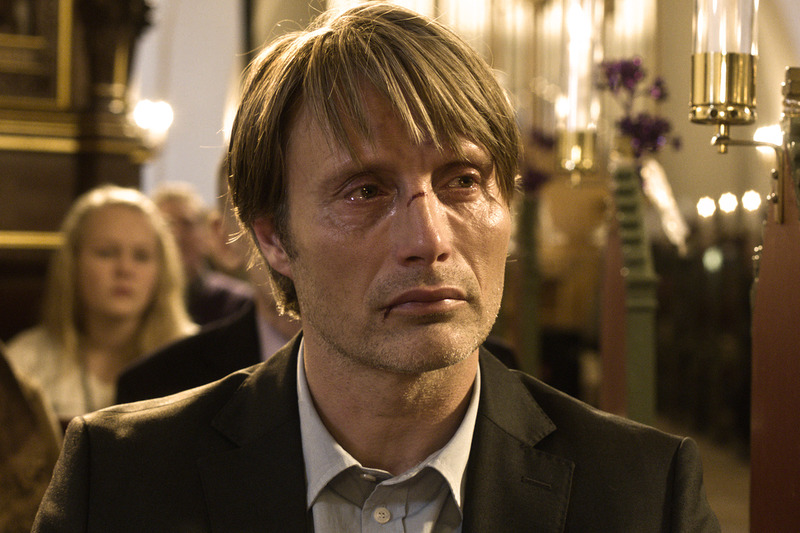 Annika Wedderkopp is gorgeous with her innocence and realisation that she may have made a huge error, and Mads Mikkelsen is able to convey a massive amount of emotion in his stillness. The Hunt was nominated for an Oscar for Best Foreign Language Film of the Year.